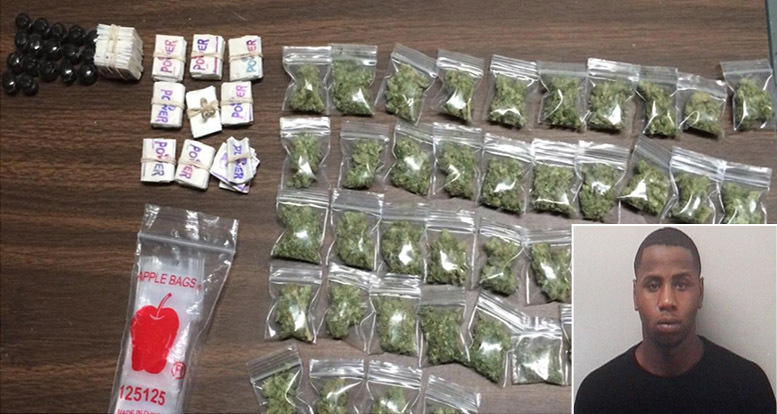 A city man with heroin, marijuana, and crack cocaine was arrested early Sunday morning when authorities pulled over a taxicab on Broadway, according to Passaic County Sheriff Richard Berdnik. Tawan Grier, 18-year-old, was in the rear passenger seat when officers conducted a motor vehicle stop of a taxicab on Broadway and Auburn Street at around 3:11 a.m. Authorities seized 12 bundles of heroin stamped “POWER,” 7 buckets of crack cocaine, and 44 bags of marijuana. 35 empty clear “Apple” ziplock bags commonly used for drug distribution were found on Grier. Grier was charged with 10 drug offenses, authorities said. He was charged on a warrant complaint and taken to the Passaic County Jail. Authorities issued a written warning to the taxicab driver for failure to signal. Didnt he play ball for Eastside? What a case of wasted talent.